True Whey amino acid profile (per 100g of protein). Summary: I love True Whey. It's impressive all-round and tremendous value for money. If you want a whey protein that tastes good, mixes well and is nutritionally sound for a low price, buy True Whey. True Whey is an excellent all-rounder. It's not the absolute best in one field, but it is good at everything. If My Protein's True Whey was a car, it would be a Volkswagen. Combine this general goodness with one of the lowest prices around for a tub of whey and you've got a highly rated whey protein on your hands. Considering how True Whey puts a big tick in every box, My Protein could easily charge £5 - £10 more and comfortably get away with it. I'd happily pay extra. Nutritionally sound. I want to use the word "good" again but I'm already starting to wear it out. True Whey contains a blend of whey protein concentrate and whey protein isolate, which means that the protein has a higher BV than My Protein's Impact Whey, which is just a whey protein concentrate. So whilst Impact Whey has a few more grams of protein per 100g, True Whey is the superior quality powder. The levels of protein exceed my benchmark of 75g/100g (True Whey's protein is 76.00g/100g) and it's only just over 200kcal per 40g serving of protein (206 kcal/serving). It's not quite as impressive as the like of Reflex Instant Whey, but it's in the right area for the differences to be minor and not worth worrying about. You can buy 25g samples of True Whey from MyProtein.com. If you don't know what flavour you're in to quite yet it will be a good idea to grab a bunch of these and help yourself work it out. True Whey doesn't deliver a powerful punch of creamy flavour (not like IntraPro for example). Instead, the taste is light and pleasant. You know when you're hungover and making a Nesquik milkshake, and you always add more powder to the milk than recommended? Well, imagine putting in just under the recommended serving size and you'll have a strength of flavour that's on par with True Whey. When I say "light" I pretty much mean weaker. But the word weak sounds negative and the taste of True Whey isn't negative, it's just different. It mixes well with other stuff (frozen berries, peanut butter, bananas etc.) without overpowering the other flavours. It's a strong enough taste to enjoy on its own. 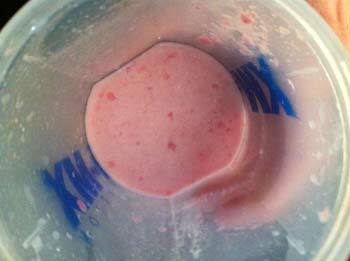 If I'm being critical I'd like for the shake to be a little bit stronger, but then again I rarely combine my whey protein with fruit or anything like that. The whole reason I buy protein powders is so that I don't have to put the effort it. Having said that, the tangy orange taste of the chocolate orange flavour is unique in the world of whey powders and something that I look forward to in the morning. 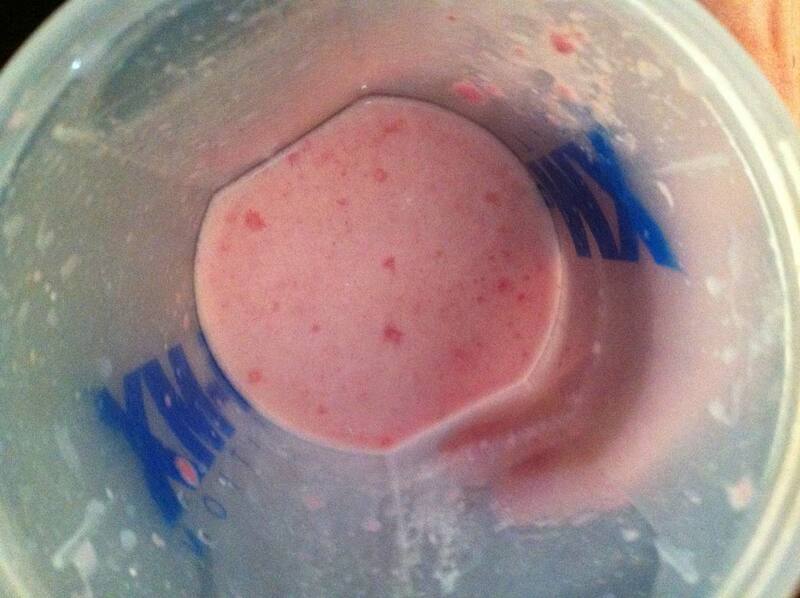 Strawberry is also very good, equally as good as the other flavours for True Whey. Not sweet or sickly at all. If you like strawberry flavoured protein powders you'll love this. 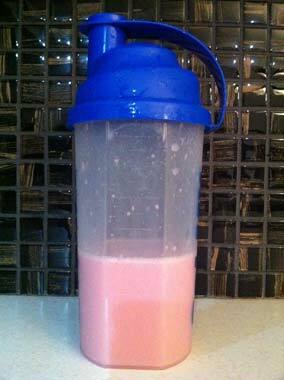 True Whey Mixability: 25g of powder + 275ml of water. True Whey powder mixes wonderfully – a few light shakes and you've got a perfectly mixed protein shake with no lumps (aside from miniscule ones) and minimal frothing. You can't fault it. You don't notice lumps this small. The only reason why it doesn't have a top score for mixability is because the powder isn't "sandy" like Dymatize Elite Whey or ON Gold Standard Whey. This means that it's a little more prone to spilling around the rim of your shaker and on to the kitchen work surface, especially if you've got clam-hands like me. To be honest this lack of a "sandy" consistency is going to make no difference to most coordinated people, and it's just the same as 90% of whey protein powders. I just like to be picky with these ratings.